Page 2: High vitamin C fruits and vegetables. High and low potassium fruits and veggies are designated for renal patients needing to watch potassium levels. 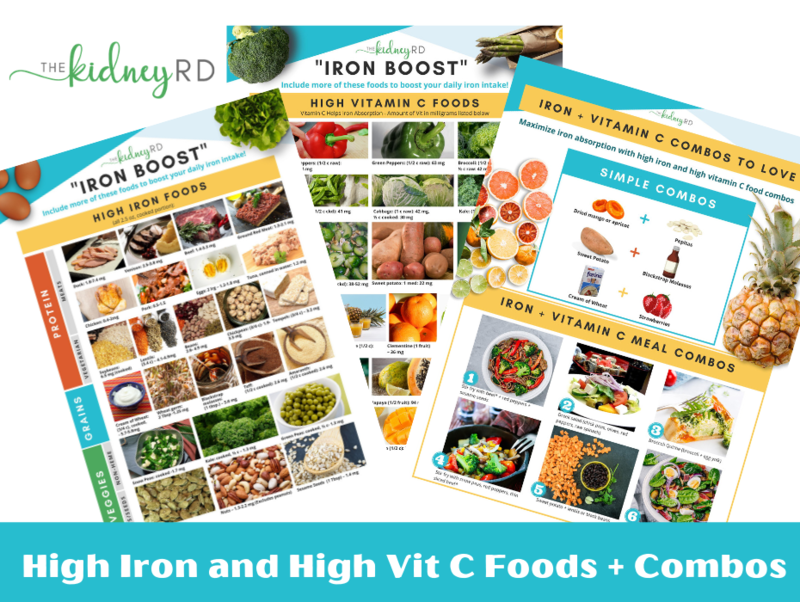 Page 3: Shows a few simple high iron + high vitamin C combos to illustrate the importance of combining foods for maximum iron absorption. Also shows cast iron skillet and lucky iron fish as tools to increase iron intake. My name is Jessianna Saville. I’m a registered dietitian of eleven years, a board certified renal nutrition specialist, and certified LEAP therapist. There is a lot of confusing information on the internet about the renal diet. Potassium, phosphorus, protein, sodium, vegetarian, and on it goes, every search leading you in a different direction. I consider myself the “can-have” dietitian and want to show all the foods people with renal failure can have, not only what they need to limit. I love helping people find answers about what to eat and find joy in every bite!